Ongoing measurement and verification is critical for the demonstration and insurance that energy efficiency projects are delivering expected and contracted energy savings. Unfortunately, energy efficiency is invisible to the eye. Retrofit projects require standardized energy analytics to recognize the cash flows from energy savings. HELIOS M&V™ (Real-time Retrofit Performance Tracking and Reporting) uses standardized measurement & verification guidelines and protocols such as the IPMVP and ASHRAE Guideline 14 to track energy reductions and savings on a monthly basis. 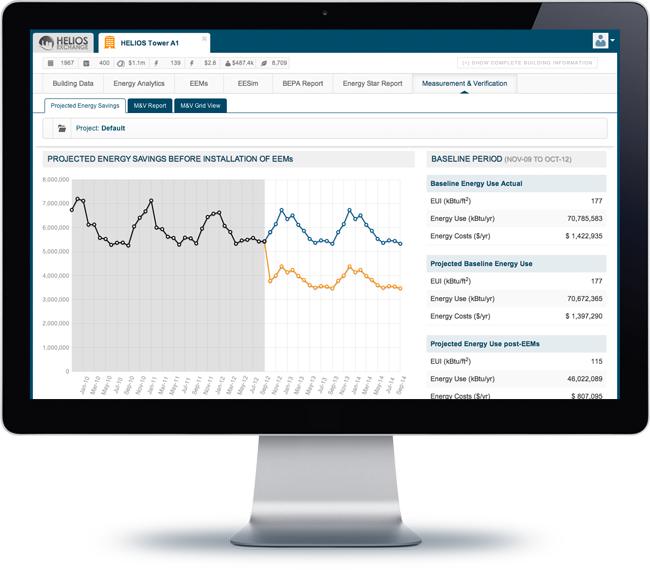 Standardized M&V through the HELIOS’ platform offers a rigorous and transparent way to track energy savings to all parties involved in a building energy retrofit (owner, lender, contractor and utility).